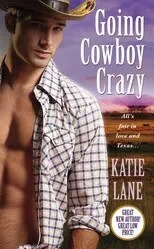 Going Cowboy Crazy Faith Aldridge wants answers. Bramble, Texas is the only place she can find them . . . as well as Hope, the identical twin sister she never knew she had. But the townsfolk reckon that shy city-girl Faith is really her long-lost sister Hope, back in Bramble at last. And they’re fixin’ to do whatever it takes to heat things up between her and Hope’s long-time flame, Slate Calhoun. If that means rustling her car, spreading rumors like wildfire, and reining in some explosive secrets, well, there’s no way like the Lone Star way . . . But Slate’s no fool. The woman in his truck may look like Hope, yet the way she feels in his arms is altogether new. He’s determined to keep this twin in his bed and out of his heart. Trouble is, the real Hope is headed home, and she’s got her own designs on Slate. If Faith wants to avoid heartbreak, she’ll have to show a certain ruggedly handsome cowboy that this crazy-impossible love is worth fighting for. Hope Scroggs is finally ready to get hitched. After years of sowing her wild oats, the former head cheerleader and homecoming queen has returned to Bramble, Texas, to marry her high school flame. But her perfect wedding plans are stomped to smithereens when her adoring cowboy two-steps down the aisle with someone else. Now Hope is stuck with the one man from her past she can’t shake: Colt Lomax, an irresistible bad boy whose sultry kisses are hotter than the Panhandle in August . . .
Colt lives for freedom and the open road; he never gets attached, never looks back. Still, he can’t forget the night of passion he once shared with Bramble’s sweetheart–a night he wouldn’t mind repeating. So, he piles on the Texas charm to tease the feisty beauty back into his bed, while she tries her darnedest to resist. But something unexpected is about to tie their fates together . . . and oh, baby, will it ever! OF EACH BOOK) TO GIVE AWAY.